Creative Retail Packaging produced specialty reusable bags and custom product packaging for client GlitzyLips, both of which were distributed at the 84th Academy Awards. “Our product needed high end retail packaging that would showcase and represent our brand,” said AthenA Elliott, Creator of GlitzyLips. “We knew the reputation of CRP would deliver this and more." Creative Retail Packaging recently had the opportunity to attend the 84th Academy Awards - dressed in a reusable bag, no less. 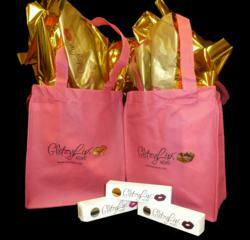 The company partnered with client GlitzyLips by creating custom reusable “swag bags” for two of the event’s gifting suites. In a moment’s notice, the bags made it to the red carpet, thanks to CRP’s swift behind-the-scenes action. “We were very excited to have the opportunity to support GlitzyLips at the Oscars this year. Even though we weren’t there in person, we felt honored to be there in spirit through our packaging,” said CRP Account Executive Suzy Knight Pittman. GlitzyLips has been a client of Creative Retail Packaging since the launch of the company’s product in early 2011, when AthenA Elliott, Creator of GlitzyLips, asked CRP to create custom packaging for her line of foil lip applications. Since then, GlitzyLips has expanded its product line to include nail and facial decals and has been worn at the American Music Awards by band LMFAO’s backup dancers and the Grammys by pop singer Katy Perry. Creative Retail Packaging is a Houston-based company with over 30 years of experience in sourcing and designing custom packaging. Founded in 1979, the company has since grown to include two additional divisions: CRP Design Studio and CRP Logistics. CRP also has offices in Seattle and Chicago, and operates three regional warehouses to support its logistics division.